Hundreds of dead seabirds have been washing up on Scotland's east coast. Scientists, who have sought reports of similar cases from across the UK, said the guillemots, razorbills and puffins died due to recent bad weather. Heavy seas had prevented them from feeding, while low temperatures had further reduced the starving, wave-soaked birds' chances of survival. 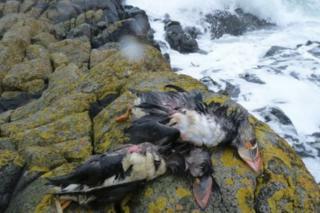 The Centre for Ecology and Hydrology (CEH) has sought information on discoveries of dead seabirds. CEH said weather dubbed "The Beast from the East" followed closely by the "Mini Beast from the East" brought a "bad combination" of low temperatures, high winds and rough seas. The centre, whose work includes monitoring the Isle of May National Nature Reserve in the Firth of Forth, said it had already gathered reports of more than 300 dead birds washing up along the east coast. It said the birds were mainly young guillemots and razorbills, but also shags, cormorants and puffins. The problems have come as seabirds prepare for the new breeding season. CEH suspects birds have been dying off in other parts of Scotland and across the UK. Reports of dead seabirds, including any ring numbers and photographs, can be sent to Mark Newell at manew@ceh.ac.uk or can be tweeted to him at @CEHseabirds. He said: "We'll bring the overall picture as it comes together. Let's hope for calmer seas and better weather."